29/12-The harsh winter faced by Northern Crowndon this year cleared up late last week, finally providing Imperial Authorities a window to make contact with several townships thought lost to the snowstorms and Blackwood shortage. While many of the towns were found in rough condition, with several dead from exposure or starvation, reports indicate that the situation is not nearly as bad as previously feared. In several of the towns, most notably Nostholm, casualties were kept to a minimum thanks to the efforts of an anonymous benefactor. When IA officials arrived, they found the townsfolk, including those reported as having been evacuated and lost, gathered in the town hall, eating a humble but adequate feast of goose and vegetables. A similar report was delivered when officials made contact with Alexander’s Crossing, sixty miles east of Nostholm. Imperial Officials claim that they currently do not have, nor have ever had, a ship named the Perdicious Platypus in their fleet. One anonymous source, however, claims that the descriptions of the mysterious ship match the profile of the Pernicious Platitude, the vessel of notorious pirate Roderick Beauchamp La Pierre. Officials have written off this claim as complete nonsense, and we here at the Gazette are inclined to agree. 16/12- Things are looking increasingly bleak in Northern Crowndon, since the first snows began to fall mid last month. As previously reported, the situation in Monteddor has led to severe rationing of Blackwood in the Crowndonian Empire. Measures were taken to keep the small settlements and townships of Northern Crowndon alight, but as the conflict has drawn out those meager allotments have stopped completely. With winter in full swing now, even Caldebeck Bay, the largest city in the north, has gone dark. To make matters worse, no one has heard from small villages like Nostholm in nearly a month. Imperial officials claim that the final reports from the region indicated that several of the town’s citizens were planning on migrating south to Caldebeck Bay, but no one ever arrived. Bay officials claimed to send out search parties, but harsh weather conditions prevented them from crossing the mountains. With its northern territories facing significant losses due to exposure and starvation, the Crowndon government is facing increased pressure to intervene in the Desantana conflict. Their stance as of this report, however, remains the same: out of concern for disrupting the balance of power created by the alliances of the Triumvirate, neither the Empire of Crowndon, nor the Empire of NorEaster, will intervene in Monteddorian affairs without the blessing of Monteddor’s government, who continue to insist they have control over the situation. Monteddor’s capital city, meanwhile, finds itself in the second month of a siege by forces led by Alejandro Julianos and Yolanda Desantana. Want more Blackwood Empire? 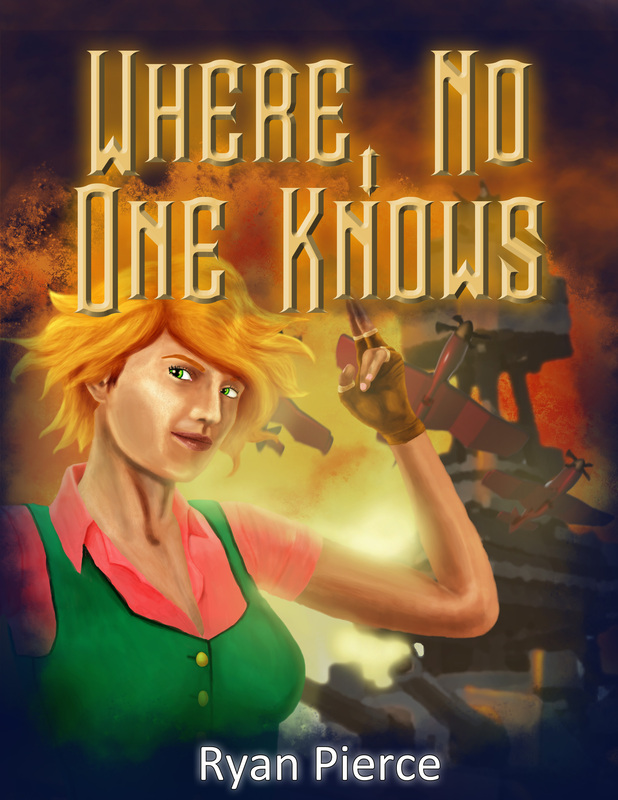 Check out the full length novel, Where, No One Knows, available now on Amazon and Createspace! 11/12– The search for notorious pirate captain Roderick Beauchamp La Pierre ramped up this week, as reports of a clash between the disgraced former Crowndonian Admiral and the equally notorious pirate hunter Johanna McKilroy came in today. The confrontation happened over the trading outpost of Majalagura, on Monteddor’s northern coast. Officials tell us that La Pierre’s ship, the Pernicious Platitude, was spotted in the area in the early morning hours of Mursday. Captain McKilroy was allegedly waiting for him. The hunter engaged her prey almost immediately, say witnesses, who described the attack as overzealous. With McKilroy’s reputation for taking down pirates no matter the cost, some were thankful for La Pierre’s quick retreat. Further reports came later in the day, saying that the Platitude was spotted making its way toward Tear Track canyon. Authorities familiar with both the Platitude and McKilroy’s ship, the Dismissive Smile, claim that it would have been La Pierre’s only avenue of escape. Neither ship has been seen since. Do you like Blackwood Gazette? Then you might enjoy the further adventures of Captain Roderick Beauchamp La Pierre and the crew of the Pernicious Platitude in the action packed full length novel, Where, No One Knows, now available on Createspace and Amazon!